Download "Ingenious Systems. Evolute System's. Mobile Payment. 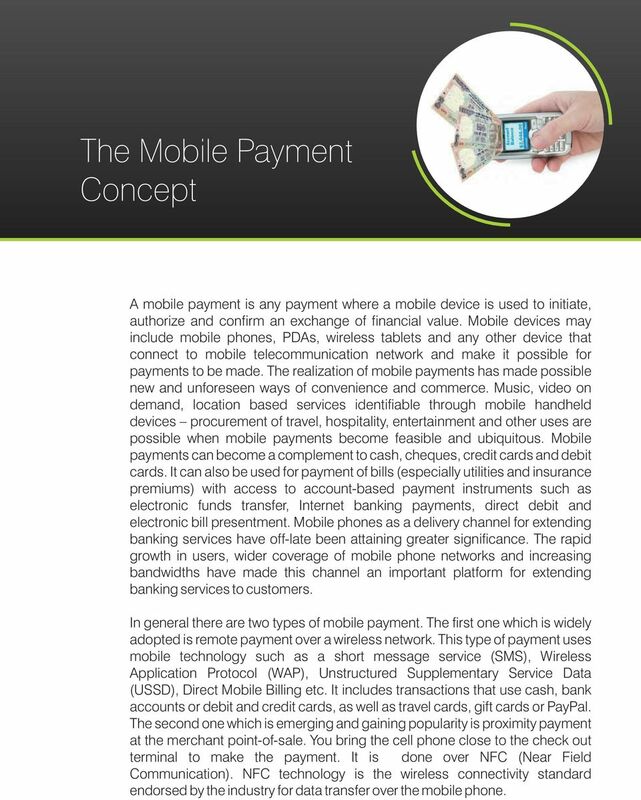 Initiative"
2 The Mobile Payment Concept A mobile payment is any payment where a mobile device is used to initiate, authorize and confirm an exchange of financial value. Mobile devices may include mobile phones, PDAs, wireless tablets and any other device that connect to mobile telecommunication network and make it possible for payments to be made. The realization of mobile payments has made possible new and unforeseen ways of convenience and commerce. Music, video on demand, location based services identifiable through mobile handheld devices procurement of travel, hospitality, entertainment and other uses are possible when mobile payments become feasible and ubiquitous. Mobile payments can become a complement to cash, cheques, credit cards and debit cards. It can also be used for payment of bills (especially utilities and insurance premiums) with access to account-based payment instruments such as electronic funds transfer, Internet banking payments, direct debit and electronic bill presentment. Mobile phones as a delivery channel for extending banking services have off-late been attaining greater significance. The rapid growth in users, wider coverage of mobile phone networks and increasing bandwidths have made this channel an important platform for extending banking services to customers. In general there are two types of mobile payment. The first one which is widely adopted is remote payment over a wireless network. This type of payment uses mobile technology such as a short message service (SMS), Wireless Application Protocol (WAP), Unstructured Supplementary Service Data (USSD), Direct Mobile Billing etc. It includes transactions that use cash, bank accounts or debit and credit cards, as well as travel cards, gift cards or PayPal. The second one which is emerging and gaining popularity is proximity payment at the merchant point-of-sale. You bring the cell phone close to the check out terminal to make the payment. 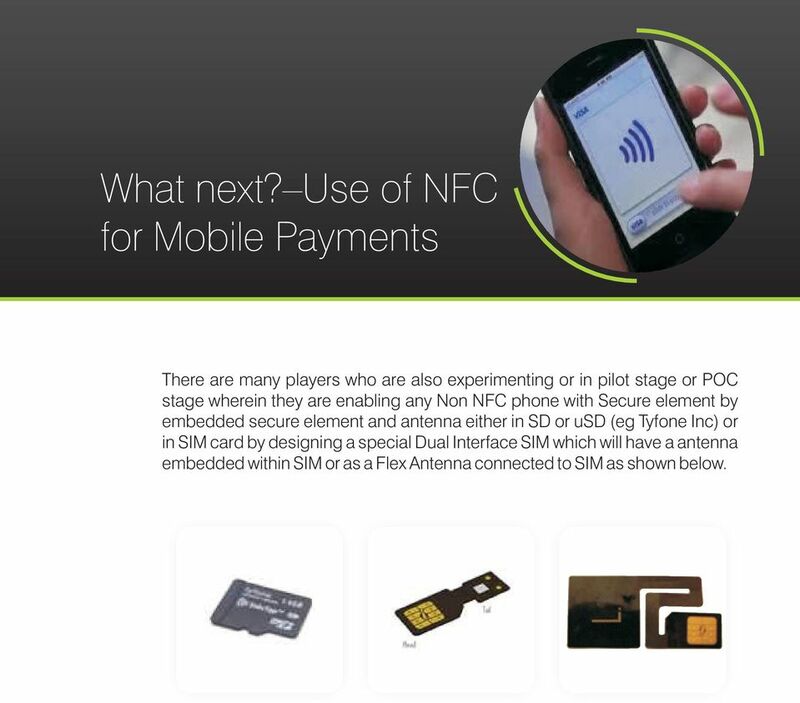 It is done over NFC (Near Field Communication). 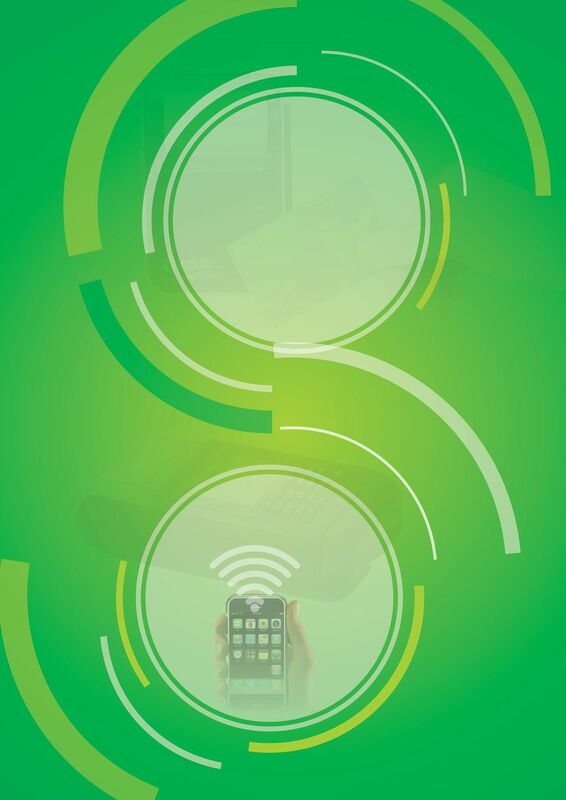 NFC technology is the wireless connectivity standard endorsed by the industry for data transfer over the mobile phone. 3 The Mobile Payment Concept Payment transactions using paper money and coins have been significantly reduced and have been replaced by electronic payment transactions over the years. Among consumers, the most common payment type is still the credit card, a product offered by financial institutions, banks, and a growing number of stores. They can be used to purchase goods and services including virtual stores in the Internet. They do not consist of real money, but of a plastic card entitling its holder to buy those goods and services based on the holders promise to pay for them and on an immediate form of credit. 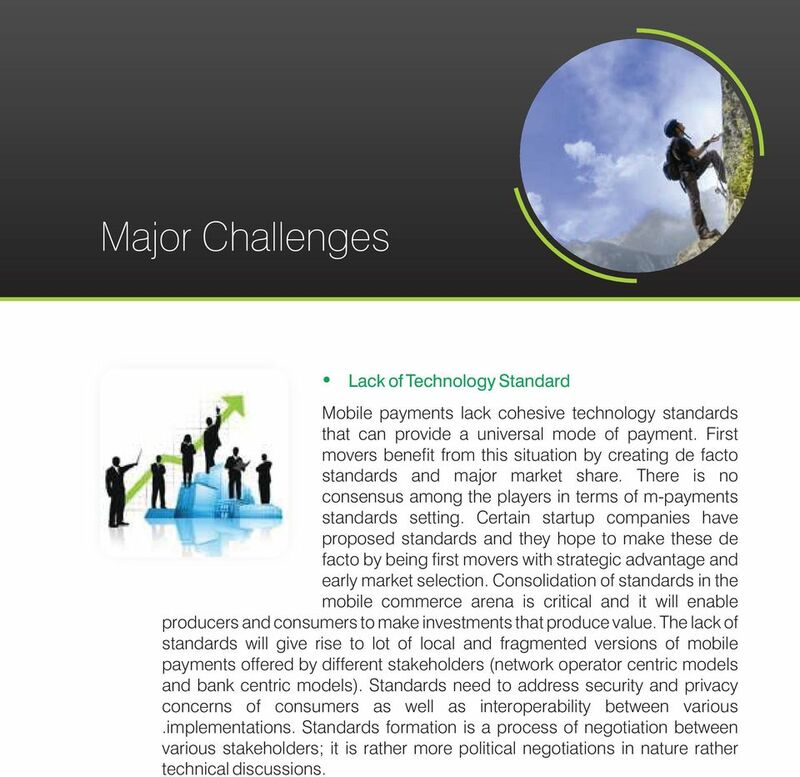 4 Major Challenges Lack of Technology Standard Mobile payments lack cohesive technology standards that can provide a universal mode of payment. First movers benefit from this situation by creating de facto standards and major market share. There is no consensus among the players in terms of m-payments standards setting. Certain startup companies have proposed standards and they hope to make these de facto by being first movers with strategic advantage and early market selection. Consolidation of standards in the mobile commerce arena is critical and it will enable producers and consumers to make investments that produce value. The lack of standards will give rise to lot of local and fragmented versions of mobile payments offered by different stakeholders (network operator centric models and bank centric models). Standards need to address security and privacy concerns of consumers as well as interoperability between various.implementations. Standards formation is a process of negotiation between various stakeholders; it is rather more political negotiations in nature rather technical discussions. 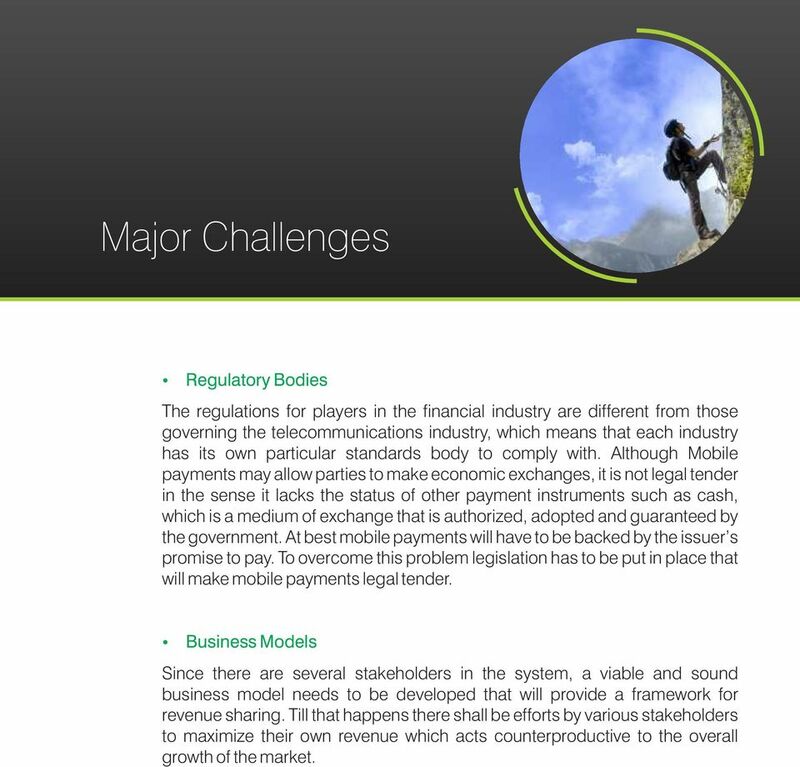 5 Major Challenges Regulatory Bodies The regulations for players in the financial industry are different from those governing the telecommunications industry, which means that each industry has its own particular standards body to comply with. Although Mobile payments may allow parties to make economic exchanges, it is not legal tender in the sense it lacks the status of other payment instruments such as cash, which is a medium of exchange that is authorized, adopted and guaranteed by the government. At best mobile payments will have to be backed by the issuer s promise to pay. To overcome this problem legislation has to be put in place that will make mobile payments legal tender. Business Models Since there are several stakeholders in the system, a viable and sound business model needs to be developed that will provide a framework for revenue sharing. Till that happens there shall be efforts by various stakeholders to maximize their own revenue which acts counterproductive to the overall growth of the market. 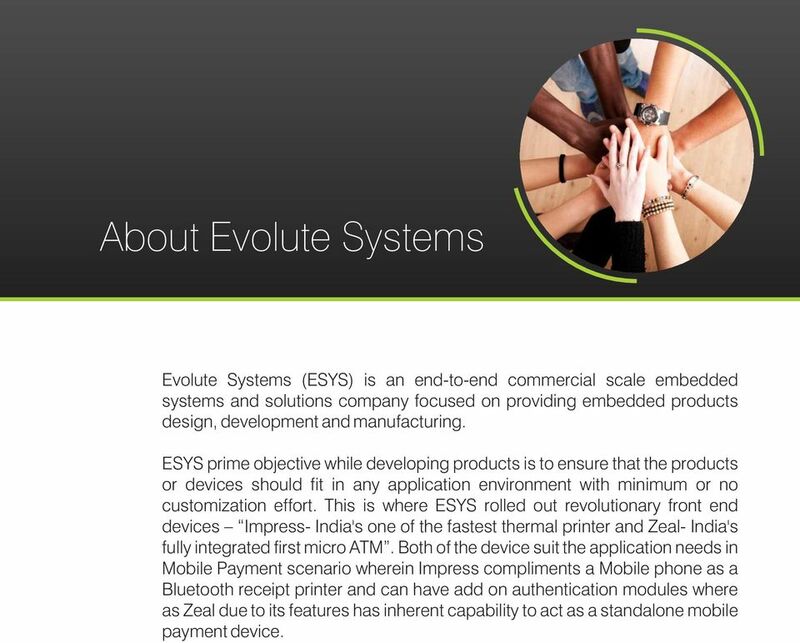 6 About Evolute Systems Evolute Systems (ESYS) is an end-to-end commercial scale embedded systems and solutions company focused on providing embedded products design, development and manufacturing. ESYS prime objective while developing products is to ensure that the products or devices should fit in any application environment with minimum or no customization effort. This is where ESYS rolled out revolutionary front end devices Impress- India's one of the fastest thermal printer and Zeal- India's fully integrated first micro ATM. Both of the device suit the application needs in Mobile Payment scenario wherein Impress compliments a Mobile phone as a Bluetooth receipt printer and can have add on authentication modules where as Zeal due to its features has inherent capability to act as a standalone mobile payment device. 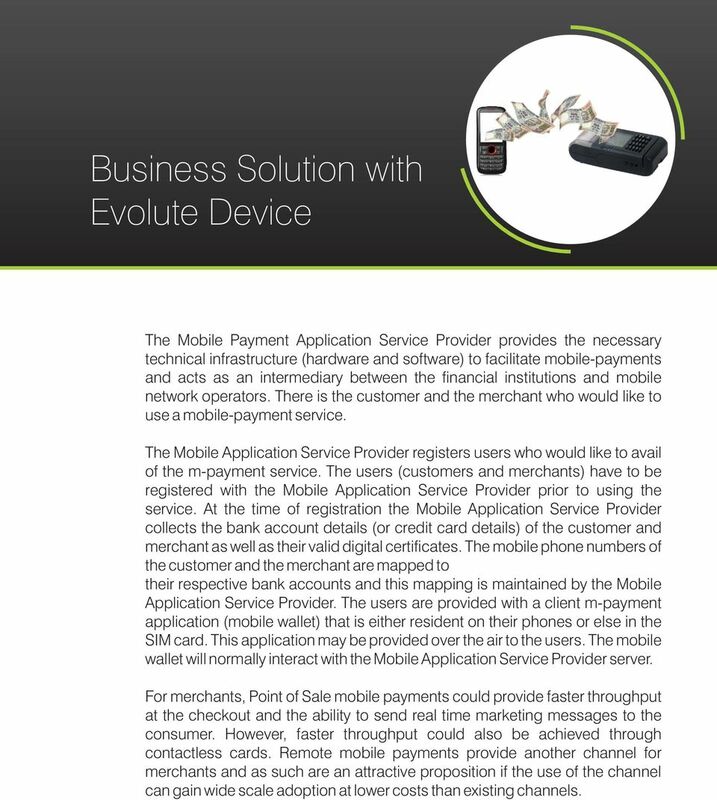 7 Business Solution with Evolute Device The Mobile Payment Application Service Provider provides the necessary technical infrastructure (hardware and software) to facilitate mobile-payments and acts as an intermediary between the financial institutions and mobile network operators. There is the customer and the merchant who would like to use a mobile-payment service. The Mobile Application Service Provider registers users who would like to avail of the m-payment service. The users (customers and merchants) have to be registered with the Mobile Application Service Provider prior to using the service. At the time of registration the Mobile Application Service Provider collects the bank account details (or credit card details) of the customer and merchant as well as their valid digital certificates. The mobile phone numbers of the customer and the merchant are mapped to their respective bank accounts and this mapping is maintained by the Mobile Application Service Provider. The users are provided with a client m-payment application (mobile wallet) that is either resident on their phones or else in the SIM card. This application may be provided over the air to the users. The mobile wallet will normally interact with the Mobile Application Service Provider server. For merchants, Point of Sale mobile payments could provide faster throughput at the checkout and the ability to send real time marketing messages to the consumer. However, faster throughput could also be achieved through contactless cards. Remote mobile payments provide another channel for merchants and as such are an attractive proposition if the use of the channel can gain wide scale adoption at lower costs than existing channels. 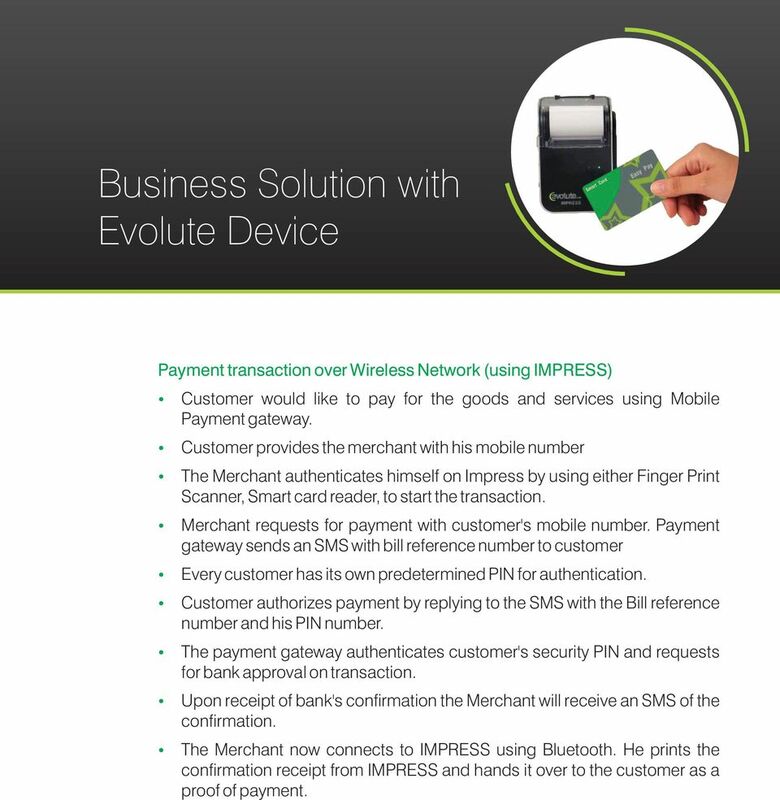 8 Business Solution with Evolute Device Payment transaction over Wireless Network (using IMPRESS) Customer would like to pay for the goods and services using Mobile Payment gateway. Customer provides the merchant with his mobile number The Merchant authenticates himself on Impress by using either Finger Print Scanner, Smart card reader, to start the transaction. Merchant requests for payment with customer's mobile number. Payment gateway sends an SMS with bill reference number to customer Every customer has its own predetermined PIN for authentication. Customer authorizes payment by replying to the SMS with the Bill reference number and his PIN number. The payment gateway authenticates customer's security PIN and requests for bank approval on transaction. Upon receipt of bank's confirmation the Merchant will receive an SMS of the confirmation. The Merchant now connects to IMPRESS using Bluetooth. He prints the confirmation receipt from IMPRESS and hands it over to the customer as a proof of payment. 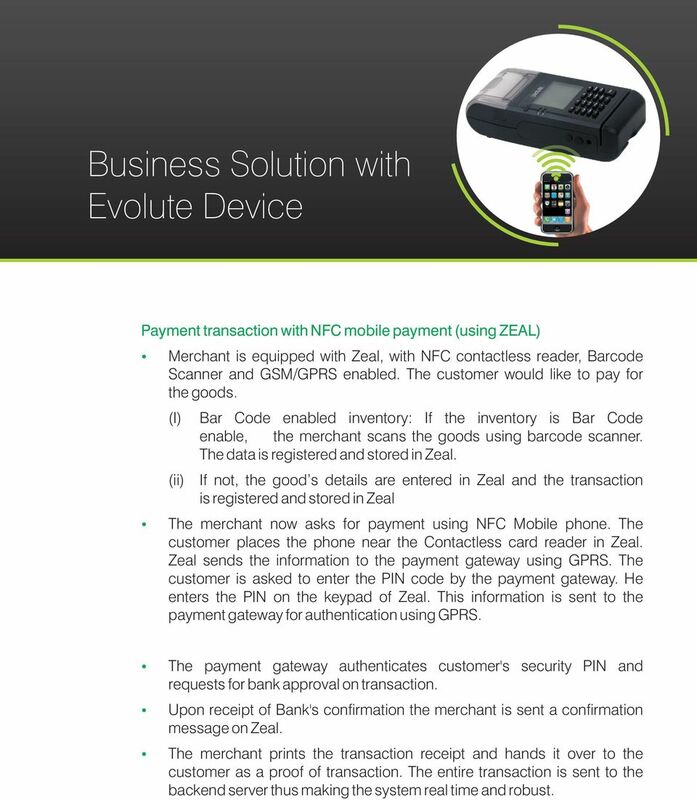 9 Business Solution with Evolute Device Payment transaction with NFC mobile payment (using ZEAL) Merchant is equipped with Zeal, with NFC contactless reader, Barcode Scanner and GSM/GPRS enabled. The customer would like to pay for the goods. (I) (ii) Bar Code enabled inventory: If the inventory is Bar Code enable, the merchant scans the goods using barcode scanner. The data is registered and stored in Zeal. If not, the good s details are entered in Zeal and the transaction is registered and stored in Zeal The merchant now asks for payment using NFC Mobile phone. The customer places the phone near the Contactless card reader in Zeal. Zeal sends the information to the payment gateway using GPRS. The customer is asked to enter the PIN code by the payment gateway. He enters the PIN on the keypad of Zeal. This information is sent to the payment gateway for authentication using GPRS. The payment gateway authenticates customer's security PIN and requests for bank approval on transaction. Upon receipt of Bank's confirmation the merchant is sent a confirmation message on Zeal. The merchant prints the transaction receipt and hands it over to the customer as a proof of transaction. The entire transaction is sent to the backend server thus making the system real time and robust. 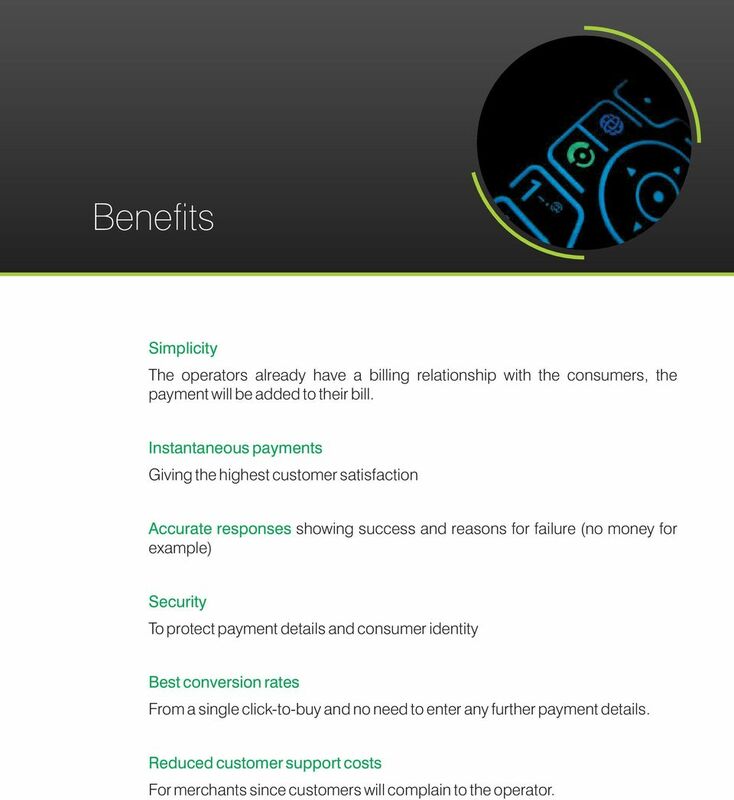 10 Benefits Simplicity The operators already have a billing relationship with the consumers, the payment will be added to their bill. Instantaneous payments Giving the highest customer satisfaction Accurate responses showing success and reasons for failure (no money for example) Security To protect payment details and consumer identity Best conversion rates From a single click-to-buy and no need to enter any further payment details. Reduced customer support costs For merchants since customers will complain to the operator. 12 What next? Use of NFC for Mobile Payments There are many players who are also experimenting or in pilot stage or POC stage wherein they are enabling any Non NFC phone with Secure element by embedded secure element and antenna either in SD or usd (eg Tyfone Inc) or in SIM card by designing a special Dual Interface SIM which will have a antenna embedded within SIM or as a Flex Antenna connected to SIM as shown below. 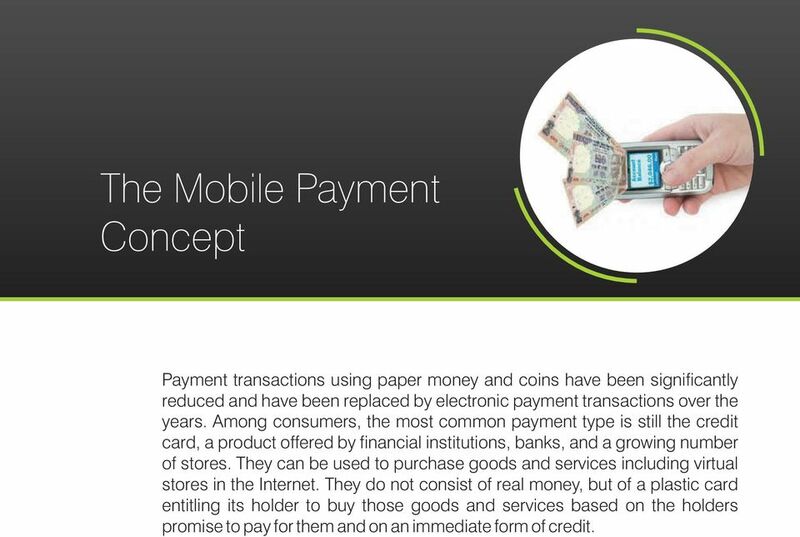 13 Summary We look forward to emergence of mobile payments in a big way across the globe. 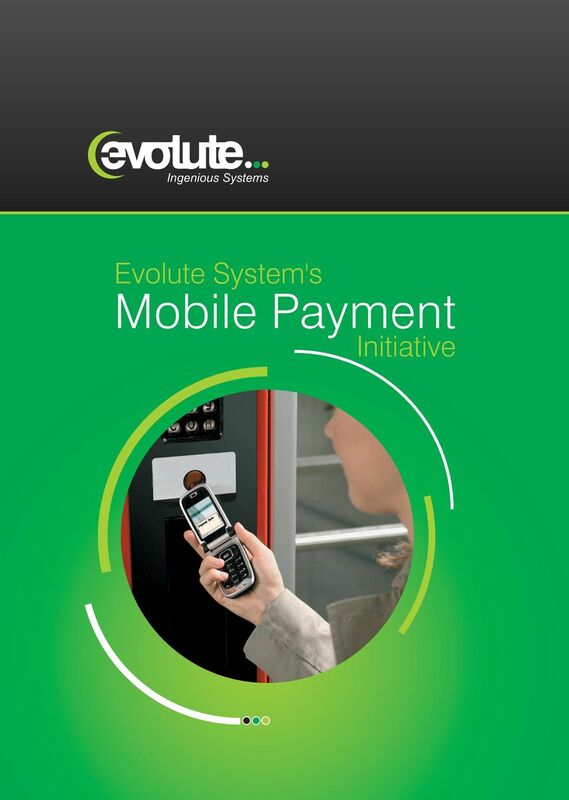 We are committed to delivering affordable devices and solutions to enable mobile payments. 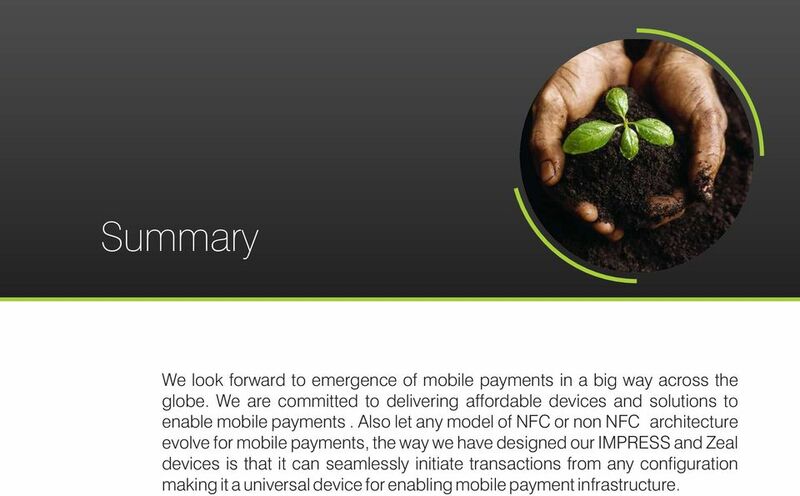 Also let any model of NFC or non NFC architecture evolve for mobile payments, the way we have designed our IMPRESS and Zeal devices is that it can seamlessly initiate transactions from any configuration making it a universal device for enabling mobile payment infrastructure. Grow with our omni-channel payment processing technologies and merchant services. The Goods, the Payment and the Mobile! permitting close proximity communication between devices in this case a phone and a terminal. E-commerce refers to paperless exchange of business information using following ways. Your Mobile Phone as a Ticket (NFC) Francisco Maria van Uden Chaves IST - Technical University of Lisbon Av. Prof. Cavaco Silva Tagus Park 2780-990 Porto Salvo, Portugal francisco.chaves@ist.utl.pt Abstract. 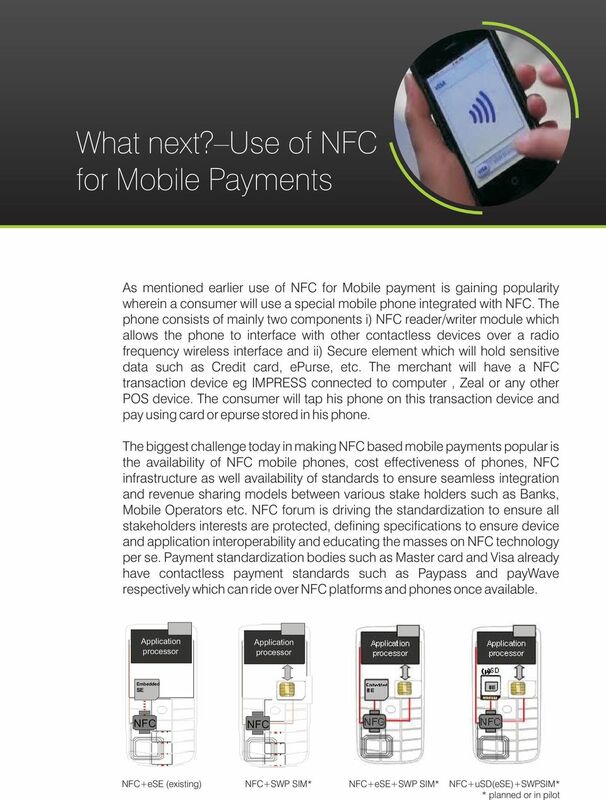 MOBILE NEAR-FIELD COMMUNICATIONS (NFC) PAYMENTS MAY 2013 THESE TECHNOLOGIES ARE BECOMING CONVENIENT AND SIMPLE WAYS TO PAY. Every day merchants seek better ways to grow their business and improve efficiency. Wayne EMV Solutions. Protect your business with a complete EMV Solution inside and out. All Business Solutions s.r.l. P.IVA 03645370283 www.abscard.com. Sede Legale Via Ripamonti, n.89 20141 Milano Tel. +39 2.36504272 Fax. +39 2. Cutting Through the Mobile Payments Confusion What Canadian Merchants Need to Know Using Mobile Technology For Payments The hype around using mobile technology for payments has been growing in recent months. Open Payment Fare Systems Save money through operational efficiencies. EMP's vision is to be the leading electronic payments processing company in the emerging markets of Africa and the Middle East.